When he published this first Dianetics article in Astounding, the magazine's editor John W. Campbell, Jr. called it "one of the most important articles ever published" and predicted that L. Ron Hubbard would win the Nobel Peace Prize. Campbell, who was always eccentric, was by this time becoming increasingly fascinated with bizarre pseudoscientific concepts such as the "Dean Drive" (don't ask). This was an unfortunate turn to his career. 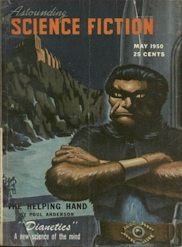 As mentioned in the May 1, 2006 Magazine of the Week, Campbell was the driving force behind the "Golden Age" of science fiction. As editor of Astounding, he discovered and/or developed most of the top SF writers from the late 1930's through the mid-1950's. The Magazine of the Week, for example, includes such all-time greats as Jack Vance, Poul Anderson, and A.E. van Vogt. Even before he began editing Astounding, Campbell was influential on the field through his own writing. Next week's Book of the Week will be a very hard to find collection of Campbell's fiction featuring his most famous story, which was first published in 1938, then adapted into a classic film in 1951 and remade in 1982. 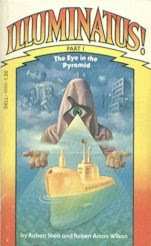 The Book of the Week is the 1975 first printing, paperback original edition of The Eye in the Pyramid by Robert Shea and Robert Anton Wilson, the first volume in the Illuminatus! trilogy. We're putting off Dianetics for a week to honor Robert Anton Wilson, who passed away last week at the age of 74. Gonzo writer, futurist, and conspiracy theorist Robert Anton Wilson enjoyed a large cult following. He authored over thirty books, including some cowritten with counterculture icon Timothy Leary. Probably Wilson's best known books are the Illuminatus! series, closely followed by the Schrödinger's Cat trilogy. The Illuminatus! novels, beginning with the Book of the Week, presume the existence of a secret society of Illuminati that has dominated the history of mankind. The premise of the books is that this society is directly or indirectly behind pretty much every conspiracy theory you've ever heard, not to mention many pop culture references (hence the yellow submarine on the cover). The assumption that all conspiracy theories are true makes for some amusing results. For example, when the novel revisits the assassination of President Kennedy, we find out there were enough different gunmen in various locations for them to have formed a union. No doubt the Illuminati were also behind the creation of Scientology and Dianetics, whose first appearance in print we will see next week. 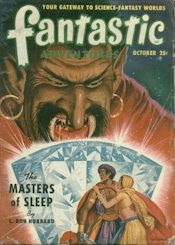 The Magazine of the Week is the October 1950 issue of Fantastic Adventures, with cover story "The Masters of Sleep" by L. Ron Hubbard (cover art by Robert Gibson Jones). L. Ron Hubbard is remembered today as the creator of the "science" of Dianetics and the founder of the Church of Scientology. But before creating Scientology, Hubbard was among the most prolific of the pulp writers, publishing under his own name and various pseudonyms including Rene Lafayette and Frederick Engelhardt. He started out writing westerns, adventure stories, even some romances, but found his greatest success in science fiction and fantasy. He was among the better SF/F writers of the pulp era and some of his early work is still worth reading today, unlike his later works Battlefield Earth (adapted into a dreadful film by Scientologist John Travolta) and the Mission Earth series (which pushes the term "later works" to an extreme, since most of the ten volumes in the series appeared after Hubbard was dead). It seems strange to many of us that the adherents of Scientology are not troubled by how strongly the premises of Hubbard's religion mirror his old pulp science fiction. (Scientology tells us, for example, that many of Earth's problems trace back 75 million years, when billions of beings were brought to Earth and executed by Xenu, the ruler of the Galactic Confederacy, and their souls continue to linger here.) Many other science fiction writers, including Theodore Sturgeon, Harlan Ellison, Sam Moskowitz, and Lloyd Arthur Eshbach, reported that before he created Scientology, Hubbard complained that writers weren't paid enough and declared that the way to really make money was to invent a religion. Next week's Magazine of the Week will be the magazine in which L. Ron Hubbard first unveiled his new science of Dianetics. Naturally, it was a science fiction magazine. The Magazine of the Week is the Winter 1941 issue of Captain Future, with cover story "Captain Future and the Seven Space-Stones" by Edmond Hamilton (cover art by Earle K. Bergey). Captain Future was the only strictly science fictional hero pulp, if you don't count Flash Gordon magazine, which lasted only one issue. 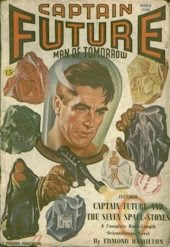 The lead story of every Captain Future magazine was by Edmond Hamilton, a respected Golden Age SF author (and husband of another respected Golden Age author, Leigh Brackett, best remembered today for writing the first draft of the screenplay for Star Wars: The Empire Strikes Back). Hamilton's lead story always starred our hero Captain Future, but each issue was filled out with stories by other authors not involving Captain Future. Notably, one of the filler stories in the Magazine of the Week is "Not Yet the End," the first published story by Fredric Brown, one of my favorites (discussed in the August 16 Magazine of the Week). We are nearing the end of our introduction to the pulp magazines. There are many other genres and important authors from the pulp era we have yet to discuss, but I have to cut this history off somewhere. However, there is one more figure from the pulps I cannot resist mentioning. Next week's Magazine of the Week will feature one of the most prolific of the pulp authors, someone who certainly was not the best of the pulp writers but may end up having the greatest impact, because he founded a religion that has hundreds of thousands of followers today.